Directions: Take 2 capsules daily or as directed by your health professional. For best results, take 1 capsule with water twice a day on an empty stomach. Temporary reactions such as minor bloating or a mild laxative effect are signs that the beneficial bacteria is detoxifying and improving the gut environment. 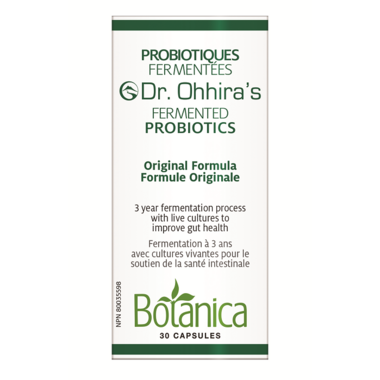 Ingredients: Proprietary Fermented Culture of 92 fruits, vegetables, mushrooms and seaweeds containing prebiotics, enzymes, bacteriocins and trace amount of vitamins, minerals and amino acids. Proprietary Organic Acid Blend: citric acid, lactic acide, formic acid, acetic acid. Proprietary Lactic Acid Bacteria Blend: 900 million CFU Ingredients are fermented and processed for three years using 12 strains of lactic acid bacteria. Other ingredients: Mountain spring water, safflower oil, beeswax, lecithin, capsule (tapioca processed from Manihot utilissima root, glycerin, carrageenan, and caramel color). Lactic Acid Bacteria used in fermentation: Bifidobacterium breve ssp. breve, Bifidobacterium infantis ssp. infantis, Bifidobacterium longum, Enterococcus faecalis TH10, Lactobacillus acidophilus, Lactobacillus brevis, Lactobacillus bulgaricus, Lactobacillus casei ssp. casei, Lactobacillus fermentum, Lactobacillus helveticus ssp. jugurti, Lactobacillus plantarum, Streptococcus thermophilus. Warning: Keep out of reach of children. If pregnant or nursing, ask a health professional before use. Do not use if foil blister pack is broken. These are great, bonus that they donâ€™t need to be refrigerated so can be used for travel too. Great vegan probiotic. Bonus that it is fermented too! Almost finished my first box and will definitely continue with this amazing product!